We are getting really exciting for the Valentine season! This year we have quite a few NEW, Beaducation Original design stamps that are perfect for making jewelry for all your loved ones. Two of our favorites include our new roses, shown in the image below. We have a Full Bloom Rose (open rose) and a Budding Little Rose. We love how they look stamped alone, together, or accompanying a name. We also love the look of our artisan pendants stamped with hearts, swallows, keys, and more! This project is a fast and easy way to make something very beautiful and simple. If you haven't noticed, all of our classes are now FREE! It's an exciting time to check out our Learning Section and watch any number of classes at your leisure. One tutorial that is pretty darn HOT and exciting is Torch Enameling. 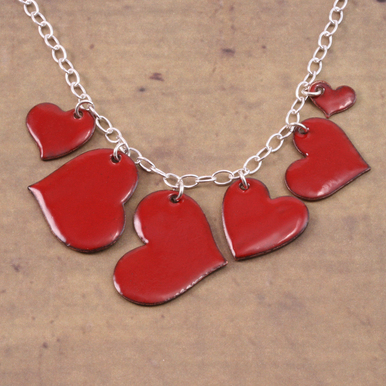 The heart necklace below is made with an assortment of our copper heart blanks that are all enameled a vibrant red. Check out the materials used in the DIY Project page and see some of our other Valentine Designs too while you're at it. It's fun to get creative and make keepsakes that people will treasure for a lifetime! Below is a grouping of the various components we put together to make this little treasure locket! We carry the actual locket on our site in both antique plated silver and copper along with the flat back Swarovski crystals, circle blanks and stamping tools. We opted to have a rainbow of glitz in this example, but how pretty it would look to have the various names and birthstones of those you love nestled inside this window locket. Whatever you opt to do this Valentine season, we hope you have fun. If you are looking to grow your skills in jewelry making or hone your techniques, Beaducation can help! Check out our various DIY Designs and our ever-growing list of free classes. We want to create an army of makers! Keep us in the loop with your creative adventures!